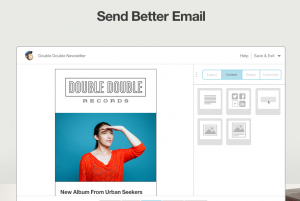 MailChimp is one company that helps prospective customers with a blog. Much of the content here on the GBW blog is about business blogging. We’ve shared with you ways that you can use a blog to attract new customers. That’s really the biggest benefit with business blogging – getting people to discover your brand. It’s the earliest stage of the sales funnel. It’s an introduction in a relationship that hopefully leads to a long-term partnership where they pay you for products and services and both parties are happy. Now the question becomes – what kind of content attracts potential customers and starts them through the sales process? What we’ve found at GBW is that content that helps your target customer is the best type of content. Celebrity chefs are great examples. They put on TV shows where they show people how to make amazing food. The viewers fall in love with those chefs. They trust them. They appreciate the help. They connect with their personalities and are willing to purchase what the chef is selling, which is usually cookbooks and all kinds of kitchenwares. You can do this with your business. Here are 25 companies that are helping potential customers with blogs. Vandelay Design offers a variety of web design services. They also have one of the most popular business blogs around. You might think that they offer design-related help with their blog (they do), but they go beyond that niche. They help their potentially customers with all kinds of helpful tips. Marketo offers a marketing software for businesses. To attract new customers they write about online marketing on their business blog. If you can think of a marketing topic you’ll find it covered on the Marketo Blog. And the advice is more than just your average marketing content. They have one of the most popular marketing blogs on the web. Some of the biggest companies have blogs including Adobe Photoshop. It’s one of the most popular software products in the world and they offer all kinds of help to their customers on their blog. And they don’t just do it with tips. They share stories of designers, which is another way you can offer help to your prospective customers on your blog – share client stories. Do you watch HGTV? It’s become one of the most popular cable channels around. Everybody is always looking for some way to improve the way their home looks it seems. Plus the shows are pretty entertaining. But HGTV doesn’t leave the helping and teaching to TV. They have a blog that helps people at home with home design. Bronto offers a complete marketing software package for commerce companies. They’re one of the biggest names in the industry and they also have a very popular marketing blog. They offer great tips and strategies to all potential customers on the blog. Starbucks hasn’t really updated their blog that often over the last year, but if you look through their archives there are some really great posts that are helpful. There are posts on how to throw tea parties and how to use certain foods to make yourself feel better and live better (mmm, blueberries). Gap and its related brands (Old Navy, etc.) have an official blog where they share trends, tips and all kinds of things. It’s a blog I hadn’t really read before until this post. There is some good stuff on this blog for those looking for some help on what to wear and how to wear it. Delta is one of the biggest airlines in the US and in the world. People are always traveling and it’s become such a hassle these days that any tips are welcomed. That’s exactly what Delta does on their blog – they help travelers with tips and tricks for lessening the hassle. Mark’s Daily Apple is dear to my heart because the information on their site really helped me become healthier. They sell a variety of books that help you eat better and workout better. They have grown to offer a variety of products and their blog is more popular than ever. efelle is a web design company provide design and marketing services. They help their potential customers by sharing tips on how to help new websites get more traffic. They help with social media and content marketing. They share stories about new launches. It all helps potential customers. EBB offers web design like a number of others out there, but how do they differentiate themselves? Well, their design style is a big reason. I’m sure they also have systems that make them an in-demand entity. But they also have a blog that seems to offer some really good advice to their potential customers. It’s one thing to help a company launch a new website. But this company takes it beyond that challenge by offering advice on marketing. Williams-Sonoma is huge in the consumer home goods industry. Their blog is called Taste and it has all kinds of helpful information about how people can make delicious things. Of course, once WS earns the trust of millions of readers those readers usually buy the goods that WS is selling. That’s how blogging works in the simplest sense. Home Depot not only sells everything you need to build and renovate your home, but they also offer helpful tips on things you can do on your own. It’s one of the industries where it makes complete sense to have a blog. There are a million ways to help people improve their homes and the Home Depot Blog is one of the best. AdRoll is one of the most successful retargeting providers in the industry. They’re a recent inclusion on the Inc. 500 list and they also have a great blog where they help potential customers with all kinds of marketing content. Follow this blog and you won’t miss the latest news in online advertising. But you don’t just get the news. You also get perspective. Field Nation is a marketplace for people to connect and do work for each other. The contractor industry seems to be growing and Field Nation provides a way for individuals to connect. Their blog is frequently updated and they seem to offer help to both those hiring and those offering work. Here’s a blog that’s really interesting. The Mall Of America is still one of the biggest blogs in the world I think. On their blog they offer all kinds of advice for finding what you need including gifts and things for yourself. MOA can write about all the latest trends, which will attract people and get them interested in shopping at the mall. Vital Farms is something I can really support. They’re part of the big movement for healthy food raised on farms that are well run. It’s about getting the food we eat to be naturally grown. The animals are also raised healthy and provided a proper diet. Their blog is still pretty new, but the posts they have published offer great recipes and other helpful information. Pinnacle Strategies offers a variety of business consulting services. They also offer great tips and advice on their blog. It’s another great way for a business to attract new clients by offering help first before seeking clients. You can offer the help, answer common questions and have the clients come to you instead of the other way around. Red Frog Events helps businesses improve culture. This is the perfect business for a blog. They’re all about culture and part of that culture is sharing tips and useful information with all types of businesses. MailChimp is very popular with businesses of all shapes and sizes. They’re an email provider and on their blog they offer great advice and help for making the most of your email marketing efforts. Marin Software offers a product that helps businesses with their online advertising efforts. Their blog has a variety of content including company updates, but they also take the latest industry news and provide insight and a point of view on what it means for their target customers. That’s a key component of a helpful blog. Take the latest news and provide direction to your customers. Mozy was one of the first online backup providers. They’re still one of the biggest and have a very popular blog. It might seem like there isn’t much to say about backing up your data, but Mozy has found a great blogging strategy that helps its customers. They help people with using data and they mix in some general help for businesses. Fundy Software has a few different products that help people manage photos. They have a blog that has content that helps people use the software. They also discuss framing and even feature stories about photographers. A great blog that helps potential customers. Copyblogger has been a blog I’ve been reading for a long time. To try and become a better writer I knew I had to be reading it. Copyblogger is interesting in that it started out as a blog and grew into a business. I’m a customer of their hosting and theme businesses. We’ve mentioned HubSpot before here on the blog. Some of our clients use their software to improve their online marketing efforts including inbound marketing, which often includes blogging. HubSpot has been blogging for years and they’re consistently a blog new clients mention to us as blogs they really admire. Moz was one of the first blogs I started reading. I was new to the online marketing world. I was curious about SEO and the place I landed was Moz. I’ve been reading their blog ever since. They have been known for their content that helps people with SEO, but now they help with all things related to online marketing. Moz sells software that helps companies with SEO and analytics. You can bet that they earn customers with the help they offer on their blog. They’ve become one of the most trusted sources in the SEO industry. These companies are helping their future customers with their blog. Now it’s your turn to do the same.